Located in a century old building in downtown Elgin, IL, within The Elgin Artspace Lofts complex, The Loft of Elements Preserved is a natural light venue, thoughtfully decorated with vintage pieces from our inventory, including specialty furniture, tables and seating. A space that requires no additional decor because of the luxury appointments already featured, allowing our guests to choose their caterer, dessert, and floral decor, and enjoy a stress-free event with their guests. 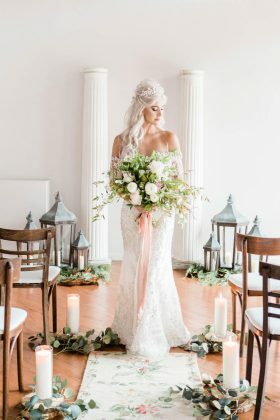 Featuring a 14 ft. wooden Harvest table as the central focal point, and allowing the vintage 24-arm chandelier to provide the finishing flair, our venue speaks of elegance and luxury in a timeless setting. With floor-to ceiling windows, the natural light venue offers the most for brilliant photo memories, while your guests dance the night away under the twinkling cage pendant lighting.